When Yoga is added in any trekking or tour, there would not be the best combination ever possible in the world. As Yoga always seeks to offer the way for union to the Supreme Self, the trekking and tours are intended to unite with the supreme prosperity and enthrallment offered by the God or the Nature Goddess. In this context, yoga seems to be highly relevant subject to follow along with the following of rugged and challenging trails of the trek. Everest Monastery Yoga Trek leads one to the high Himalayan range of Khumbu region, one of the most visited places in the world. Because of its affluent and amazing cultural, natural and spiritual ambience, it not only has been visited as a place to see the highest mountains in the world but also for the spiritual awakening and awareness. The land of Himalayas is the abode of enlightened souls. In this regard, even though the life-style and climate may be observed as hard and heavy to sustain, it is actually the blessing and examination of the nature God to the humanity. If one can’t dare to adopt and adore the beauty which has been offered by the nature rather than focusing on the pain and difficulty of the trail, there is no justification to enjoy the marvel and magnificence of the Himalayas. The journey in itself is conceived as an open book of knowledge which always leads the ascending route for understanding and exploring the self. Indeed, the trek or any visit in its external sense seems to be merely for observing the natural and panoramic mesmerism of the world. In addition to the external contentment for our mind and eyes, it also aspires for the eternal and individual cleansing and clarification of the self. Everest Monastery Yoga Trek starts with the short flight from Tribhuvan International Airport to Tenjing-Hillary Airport Lukla. During the trek, yoga will be included as its regular practice every day. Landing on the height of about 2600 meter from sea level, the trek takes increasing altitude up to 3800 meters at Tengboche Monastery. During its splendid and marvelous offerings of the natural beauty, culture heritage, religious affinities and spiritual contentment, Everest Monastery Yoga Trek trails the way on the lush vegetation of Sagarmatha National Park while enjoying the greenery pine forests, blossoming rhododendron trees till reaching to Namche Bazaar which is situated at an altitude of 3440 meter. The rest day at Namche Bazaar also allows the trekkers to visit the local Thame Buddhist Monastery, the oldest monastery in the Khumbu region also famous for its grand reception in Mani Rimdu Festival. The trek also takes the trekkers to Tengboche Village where the visit to Tengboche Buddhist Monastery will be crucial expedition to experience. Tengboche Village also extends its amazing platform to view the picturesque panorama of the highest mountains in the world such as Mt. Everst, Nuptse, Lhotse, Ama Dablam and Thamserku. The trek keeps inspiring and alluring the trekkers as it leaves to the scintillating Khumjung village where Khumjung Monastery is located which has been distinguished place to remember for Yeti scalp on its display. The last and unforgettable adventure of the trek to Syangboche Stupa greets the trekkers with the priceless and unalienable view of Mt. Everest on its milieu. Everest Monastery Yoga Trek leads one to the high Himalayan range of Khumbu region, one of the most visited places in the world. Because of its affluent and amazing cultural, natural and spiritual ambience, it not only has been visited as a place to see the highest mountains in the world but also for the spiritual awakening and awareness. The land of Himalayas is the abode of enlightened souls. In this regard, even though the life-style and climate may be observed as hard and heavy to sustain, it is actually the blessing and examination of the nature God to the humanity. If one can’t dare to adopt and adore the beauty which has been offered by the nature rather than focusing on the pain and difficulty of the trail, there is no justification to enjoy the marvel and magnificence of the Himalayas. The journey in itself is conceived as an open book of knowledge which always leads the ascending route for understanding and exploring the self. Indeed, the trek or any visit in its external sense seems to be merely for observing the natural and panoramic mesmerism of the world. In addition to the external contentment for our mind and eyes, it also aspires for the eternal and individual cleansing and clarification of the self. When Yoga is added in any trekking or tour, there would not be the best combination ever possible in the world. As Yoga always seeks to offer the way for union to the Supreme Self, the trekking and tours are intended to unite with the supreme prosperity and enthrallment offered by the God or the Nature Goddess. In this context, yoga seems to be highly relevant subject to follow along with the following of rugged and challenging trails of the trek. After receiving at the Tribhuvan International Airport, you will be taken to the hotel. The same day will be arranged to meet with the representative of The Trek Tour and Travel Nepal for the final preparation and short briefing of the upcoming trek. Yoga Asana class in the morning. The flight from Kathmandu to Lukla will be of about 45 minutes early in the morning. After landing at the Tenjing Hillary Airport at Lukla, you will be welcomed by the crew members of the trek. Packing and arranging the luggage you will walk through the Lukla village heading towards Phakding. About 4 hours of trek from Lukla airpot, you will reach to Phakding. Overnight at Phakding. Pranayama and Meditation class in the evening. The day starts with crossing the Dudhkoshi over the bridge, the first of several bridges coming up. The trail moves through the forest and the villages Benkar and Chumoa are also left behind to reach Monjo, the place for lunch. Then, the trail enters into the Sagaramatha National Park. The trek heads further up north through the bank of the Dudhkoshi River occasionally crossing it over the bridge. Along with the bank of the Dudbkoshi River, the path has been beautified by the forest of rhododendron, magnolia trees, and various kinds of flowers which blossom both in spring and autumn. After Jorsale, Bhotekoshi River is also crossed to ascend steep up about 300 meters to see the first glimpse of the Mount Everest in the backdrop of Nutpse-Lhotse. Further climbing welcomes us with the famous and well-known hub of Khumbu region called Namche Bazaar. Overnight at Namche Bazaar. It’s day of acclimatization as well as the day for visiting the central town of this region. This day will also take you to Thame Buddhist Monastery to visit the serene and spiritual aura of the place. It will be a good hike to experience for the day for body, mind and soul. Besides, you can also visit to Tourist Centre situated nearby the headquarters of Sagarmatha National Park in Namche Bazaar. The trek of this day will grant you the blessing of enjoying the spectacular and scintillating view of Mount Everest, Nuptse, Lhotse, Ama Dablam etc. About 6 hours of walking through the rugged and exotic trail, the destination for the day, Tengboche, will be seen. 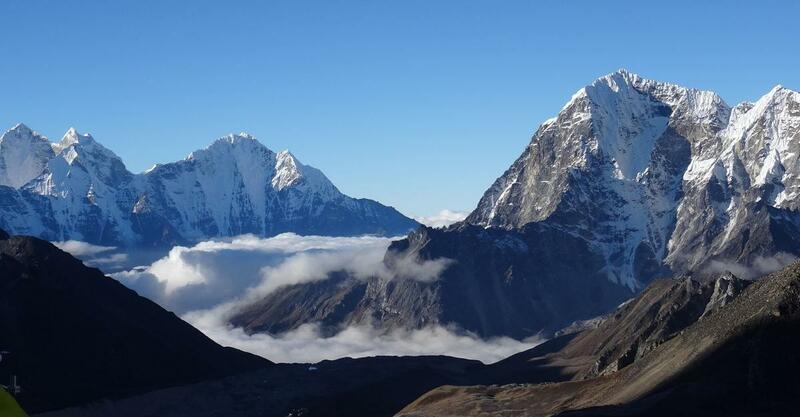 Tengboche is honoured and heightened as the spiritual centre of Khumbu region. Monks of all ages come to observe and participate in the rituals and religious studies from every corner of the region including different parts of the country. Tengboche carries unbelievable aura and energy of spiritual practitioners. Descending down for about 2 hours through the forest of pine and fir trees, the trek pass across the Dudhkoshi River to follow the path through the bank of the river passing through small village until it reaches to Khumjung Village. The Khumjung valley is well-rounded by the snowy peaks of Thamserku, Kondge including the holy peak Kumbila. It has a beautiful and sacred Khumjung Monastery which also preserves the precious Yeti Scalp. The visit to nearby Hillary School will also be conducted. Overnight at teahouse. Khumjung Village is left behind trailing through the stone-made pathways. The beautiful path of stone continues until the trek arrives at Khunde village, the clean and traditional village of the region. Leaving behind the charming village of Khunde, the trail follows the secluded path. The occasional meeting with yaks and herders on the way would entice and enlighten the hearts of the trekkers by their innocent smile and hardworking nature. While paving through the trail, the amazing views of the world’s highest mountain Mount Everest and many others would engross the trekkers more and more. Eventually, walking for about 3 hours, the trek comes at Syangboche. A few minutes of walk takes to the Syangboche Stupa. Overnight at teahouse. From Syangboche, the trek descends down to the stone-stair for about one hour until it arrives to Namche Bazar. The short rest and shopping can be made at Namche Bazaar as the trail will continue further. Dudhkoshi River will be crossed after descending down the Namche Hill. As the trail crosses the Dudhkoshi River, the area of Sagarmatha National Park ends which leads to today’s destination Monjo. As being the serene and quiet place to rest, Monjo has been chosen to stay for the night. While enjoying the splendid magnetism of magnificent mountain seen to the far, the trail paves further through the open plains, forest of pine and rhododendron trees. The unforgettable moments can be many but one of the them certainly be the stone carving and painting with Buddhist mantras and chants almost each and every corner of the path. There is not any even stone which can’t be seen without any writing on it. As the last day of the trek, it can be a wonderful trek to recollect all those adventurous and exhilarating time past for few days in the land of holy Himalayas. Overnight at Lukla. This day flies the trekkers to the capital city of Kathmandu with the collection of all the life-inspiring moments in the heart and mind. Sometimes, because of the bad weather the flight may not be arranged on the stipulated day. In this case, the flight back to Kathmandu will be arranged in the next morning. Everest Monastery Yoga Trek treks has comprised the practice of yoga and trek together. It’s like one journey two benefits. Even though the trek has fairly been targeted to visit some incredible and awe-inspiring scenario of the Himalayan range as well as experiencing the cultural affluence of the region, Everest Monastery Yoga Trek also intends to offer you some relaxing and gentle yoga practice twice in a day as its exclusive program. The day begins with some asana practice in the morning and ends with pranayama or the breathing techniques along with some meditation in the evening. In between two session of yoga, the trekkers follows the trekking route and enjoy the delightful time. In order to cope with the high altitude and cold climate, Everest Monastery Yoga Trek has come up with an interesting idea of yoga with trek. During those challenging and adventurous journey to the high mountains ranges of the world, one may definitely get excited and thoroughly enjoyed. On the other, there is always a chance of being fatigued and exhausted by the everyday trek. With the sincere hope and intention, Yoga has been tried to incorporate in the trekking to address the issue of physical exhaustion and mental determination. More than anything else, the yoga has a target to explore and indulge into one’s self. The self-inquiry and world-exploration go simultaneously. Everest Monastery Yoga Trek offers many relaxing and stretching asana practices to the body which has been tired. To accelerate and energize the stamina of the physical body and willpower and intension of the mental body, both asana and pranayama along with meditation can be comprised during the Everest Monastery Yoga Trek. Yoga practice has been one of the most amazing art and science practiced since thousands years. Interesting to say that the origin of Yoga is this holy Himalayan range. The first yogi of the world called Lord Shiv is believed to have abode in the Himalayan range. The same yoga which was practiced for generation to generation has been tried to combine with some explorative trek. In spite of its global expansion and recognition, Yoga still has been the part of hidden practice coming to this time in many parts of the world. One of those places is the Himalayan range of Nepal where Buddhist Yoga and many other spiritual practices are conducted solely for their own sake which has been confined to them only. Keeping the very fact in mind, the yoga which was incepted in this part of the world has now never been common practice and rather it has been very secret one. Considering the essentiality and importance of yoga in life for all the people and for the wellness and awareness of many trekkers and for their physical health, The Trek, Tour and Travel Nepal has designed the Everest Monastery Yoga Trek to serve our valued trekkers with yoga and trek. The most wonderful reason to practice yoga is its integral nature to our life. The existence of life is possible because of the union of vital force or the Prana Shakti with the physical body. Once the life energy leaves the physical body, there is no longer the existence of our life. The yoga teaches us to play and practice with the vital force and enjoy the beauty of life without being frustrated because of the past and being anxious for the future. Yoga is the union of body, mind, and soul at its optimum level. While trailing the risky and rocky trails of the mystic mountains of the Himalayan range of Nepal, one would definitely feel some sort of sublimity and ecstasy. Moreover, during the trek, one also may get feel sore and pain in the physical body. In Everest Monastery Yoga Trek which continues for ten days one may also need some relaxation and treatment to the body. In such high altitude, there may not have lot of luxurious options to get relief from the sore of the body. There is definitely one system which can be incorporated in the range of mighty mountains i.e. yoga. Because of being the origin place of Yoga and meditation, the Himalayan range would always be welcoming and receptive to the practice of such even though it has been secret practice in this part of the world. Therefore, The Trek Tour and Travel Nepal believes yoga can be a wonderful combination to adopt with the trek in the vast and magnificent trek to the mountains of the Nepal.